Telendos island in Greece. Accommodation. Boats. Beaches. 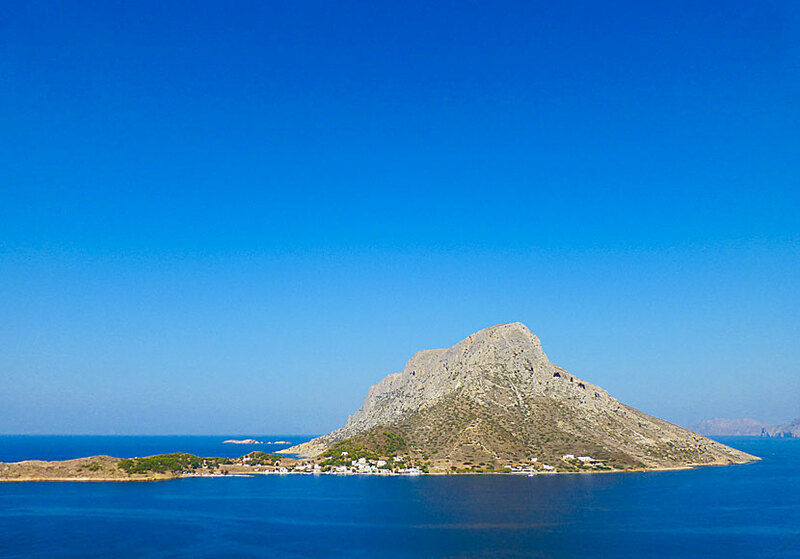 The mysterious rocky island of Telendos is facing the seaside resorts of Myrties and Massouri in Kalymnos, the Dodecanese. From a distance Telendos looks like forgotten properties from the movie Close Encounters of the Third Kind. Those of you who have seen the movie knows what I mean. The left mountain side of the island is called "Princess on the mountain." According to a legend, a princess turned into stone when she tried to kill herself when she thought her beloved prince had drowned. When she threw herself off the cliff she was "rescued" by a fairy who turned her into a rock. Even today you can see her face in the mountain. The princess is best seen from a distance, and preferably in the morning when the light is better. Telendos is a small island with not more than about 90 inhabitants, the area is only a few km2 and the highest mountain is 459 meters above sea level. 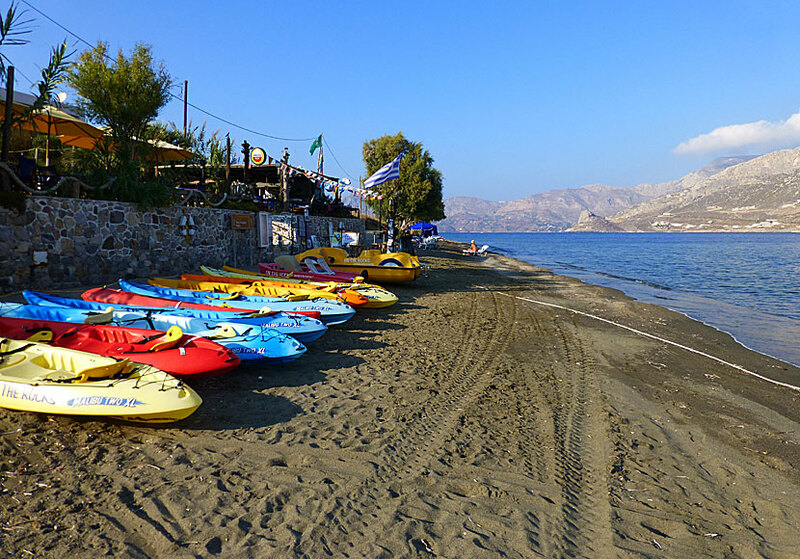 The island is frequented especially by day trippers from Kalymnos. 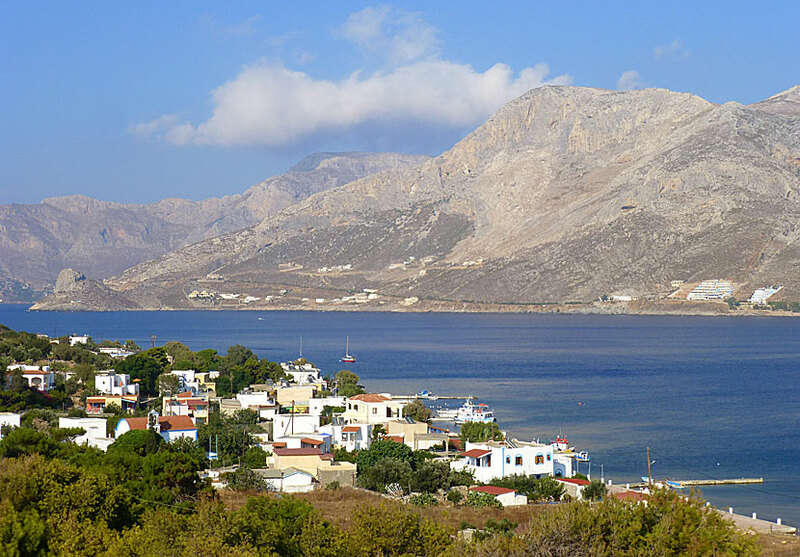 And if you are staying on Kalymnos, whose traffic is, to say the least, busy, it's a relief to go to Telendos. The car-free port promenade in Telendos. Ritas Taverna to the right. It does not matter what time of day it is, on Telendos it is always quiet. Evenings are incredibly peaceful. Magical, tranquil moments at tavernas is the amusement on offer. If you are travelling independently to Telendos you can go by air to Athens, Kos or Samos, and continue by ferry to Kalymnos. From the port of Pothia, go by taxi to Myrties, and from there continue by caïque (traditional fishing boat) to Telendos. The caïques leaves every half hour from eight in the morning until midnight. The trip across takes about five minutes and costs 2 €. In theory, one can swim across, but the caïques are still preferable. :-) In the strait between Kalymnos and Telendos it is said to be a sunken city. But I have never seen any traces of it. 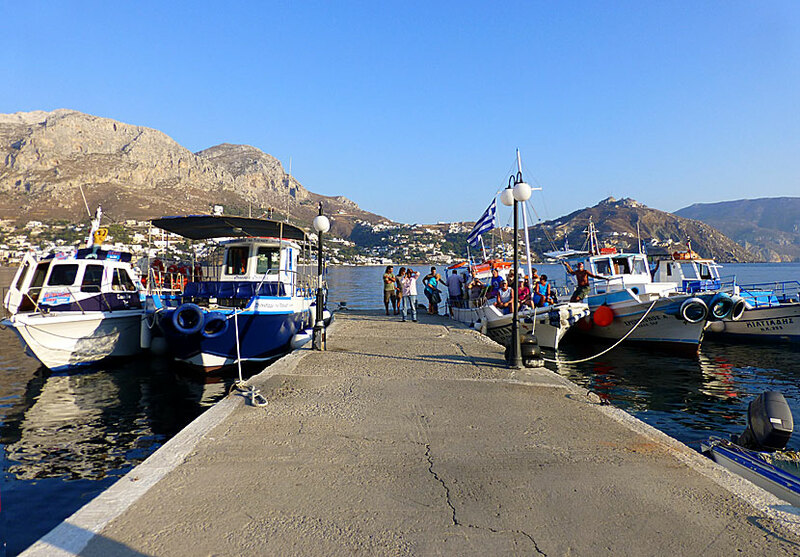 The port in Telendos and the small boats that goes to Myrties on Kalymnos. There are no roads, cars, scooters or other motorized vehicles. The only way to get around is on foot, but who cares when the distances are so short. In principle, there are only two directions to go, left or right. Should I be precisely, and I should, there is a small scooter on the island and it is used to collect garbage. The garbage then go by boat across to Kalymnos. There is only one village, and it is small. What you see when you arrive by caïque is the village itself, it is not bigger than that. Here are a few tavernas and a couple of cafes. Furthermore, there are two mini markets and a beautiful light blue church. There are no streets, only some paths and a few alleys. You will quickly get a complete picture of the village. It is cosy, peaceful, enjoyable and quiet. In fact, Telendos along with Marathi and Hydra, is the quietest island I have ever visited. The only village in Telendos. As said, there are a number of tavernas and the difference between them is marginal. 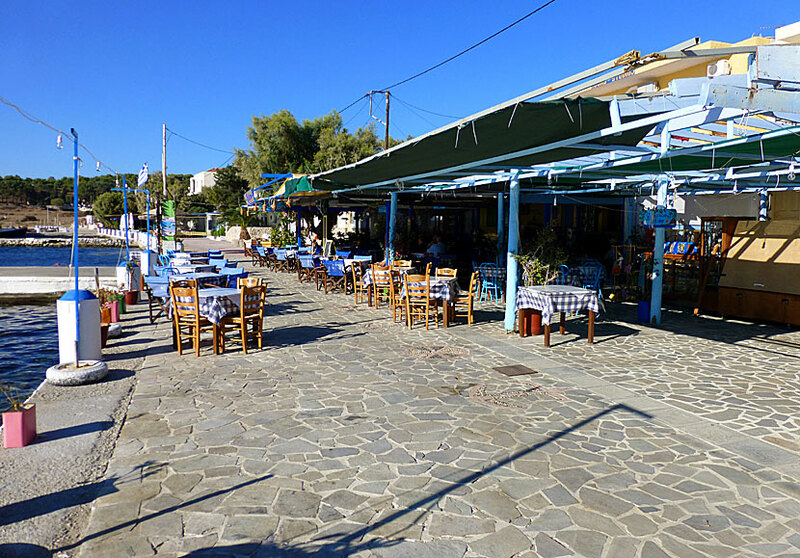 If you stay on Telendos you can try a new taverna every evening, after a week you have eaten at all of them, and may choose a favourite. I myself like the fish taverna To Kapsuli. Here you can be seated and eat right on the water's edge, and if you feel like it, you can dip your feet in the sea and chew on a skewer at the same time. It is that close. To Kapsuli is to the right in the village, if you have your nose towards Telendos. Further off to the right lies more tavernas, including On The Rocks, and they have rooms for rent as well. 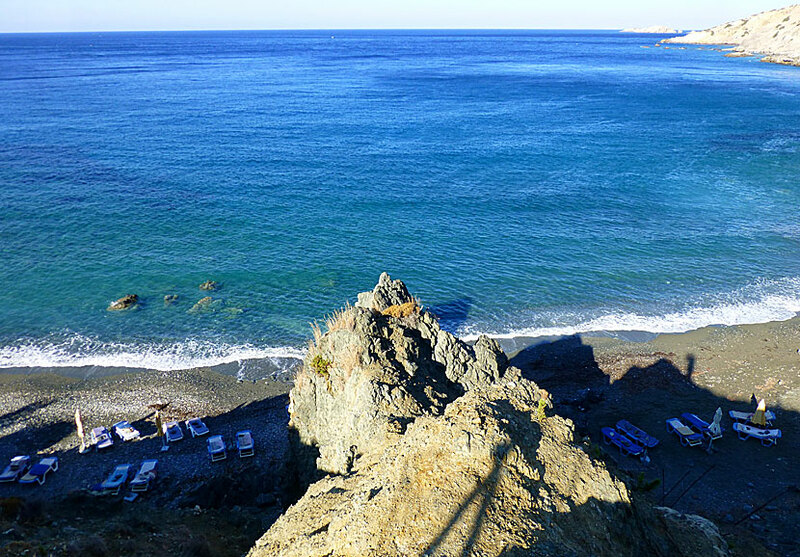 The small beach in the village and On The Rocks. Another favourite is Barba Stathis on the waterfront at the far left in the village. They also have tables in the alley leading to Hohlakas beach, the food is the same at both places, but the section that is on the waterfront is most pleasant. Barba Stathis serves mainly fish, and then we talk about fresh fish. Restaurant Rita at the water front. 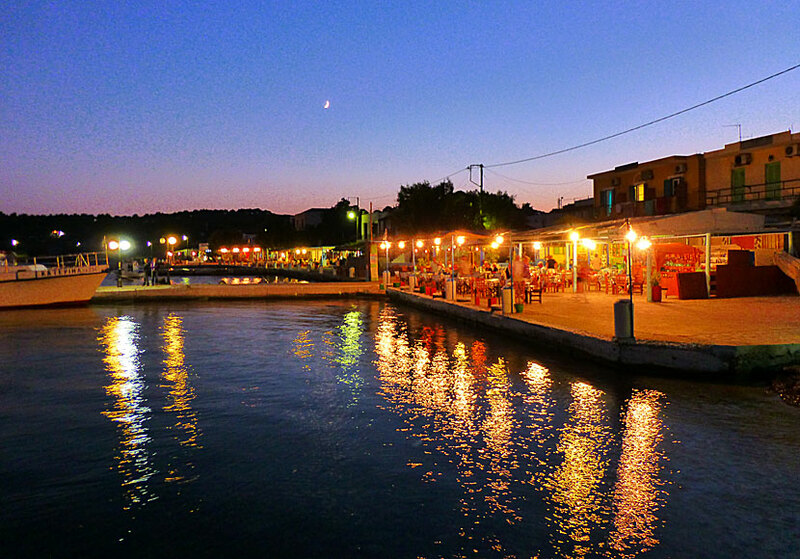 In my thought, the most pleasant taverna is Restaurant Rita located at the pier where the caïques berths. Restaurant Rita is for many a meeting-point, little like an adult day-care. Here, you can be seated for a long time and people watch, or play a game of tavli (Greek backgammon), or maybe read a book. Yannis, who is serving, is one of the nicest Greek I have met. It's just as well that I mention it at once: the beaches on Telendos is far from some paradise beaches, but the sea is clear and clean, especially at Hohlakas beach. Most of the beaches consist of pebbles mixed with some sand, but there are beaches with sand, like the beach to the right of the village, in the direction of On The Rocks. Continuing after On The Rocks you will soon arrive to two small beaches. The last of them is called Paradise beach and it is the island's official nudist beach. The beach is tiny and it is crowded during peak season. Hohlakas beach early in the morning. Personally I prefer the two-piece Hohlakas (Cholakas) beach. You get there if you go to the left of the port, through the village, pass the church and walk up the hill. The water is lovely, there is excellent snorkelling opportunities and nice surroundings. No temples. No monasteries. No excavations. No museums. Telendos is exempt from "you-just-have-to-see-things." There is only some old church ruins and tombs, and a cute donkey named Odysseus. You find Odysseus in a small meadow on the left (nose towards land) of the village. He likes vegetables (preferably carrots) and fruit. If he notices that you are heading towards him to give him treats he yells of joy. He is really cute. Agios Georgios church in Telendos. 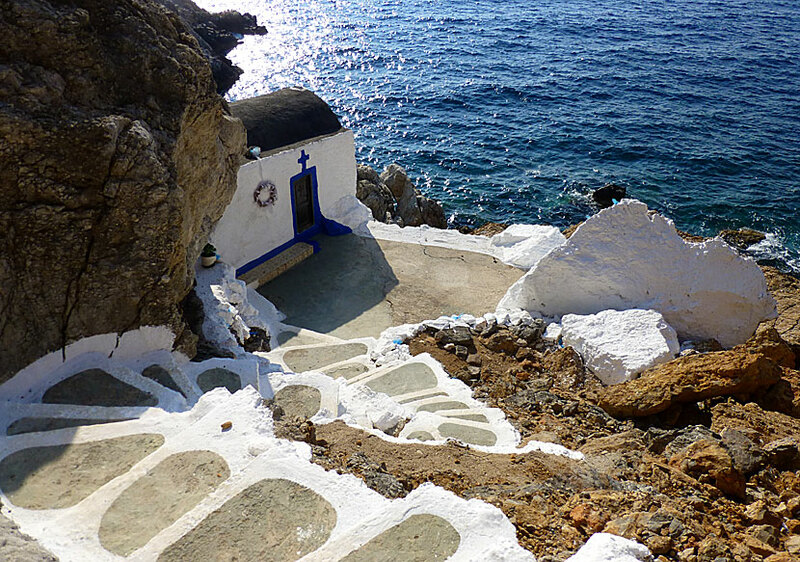 If you like Greek churches I can recommend you to go to Agios Georgios church which is near Hohlakas beach. The small chapel would probably be Telendo's most visited and it is very beautiful. 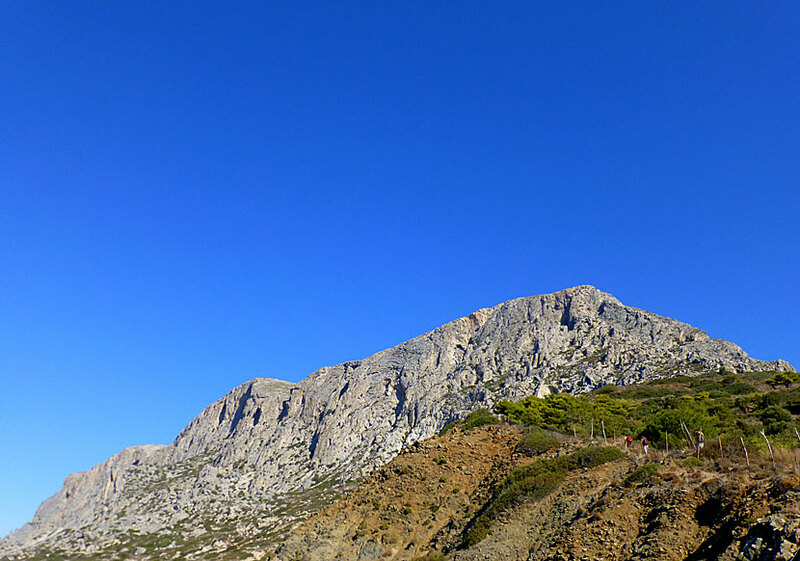 Telendos is, just like Kalymnos, attractive among climbers. Thanks to them, there are beaten tracks that lead to different climbing areas. One path goes to the right, and continues to the other side of the mountain. Another path begins above Hohlakas beach. The path initially follows a fence, and leads to "the princess". I have not walked that path, but a Dane I met last time I was on Telendos told me about a magical hike. He used to walk up there three four times a week to enjoy the view and the silence. He said it is incredibly meditative to just sit up there. Not even the sound of the sea is reached there. If you are lucky you can see Eleonora falcons. On a hike to the "Princess" in Telendos. There are more choices of accommodation than you might think. Most of the tavernas have simple rooms for rent, and there are several pensions and one hotel with a pool. Although the range is large for such a small island, it is not always easy to find a room without booking in advance. Last time we were here, almost everything was booked out. It was just before the Climbing Festival on Kalymnos, so perhaps it should not have been a surprise. View of Kalymnos from Studio Evagelia in Telendos. We usually stay at Studio Evagelia which is a simple guest house with fantastic views over Kalymonos. If you want to stay a little more fluent then choose Hotel Porto Potha which even has a pool.